Dubai, UAE, May 28, 2018: Tamdeed Projects, a subsidiary of Etisalat Services Holding, exhibited a strong presence at the recently-concluded 2018 BICSI Middle East & Africa (MEA) Conference and Exhibition, reinforcing its commitment to support the ICT community and promoting innovation within all aspects of telecom network and smart city solutions. The two-day BICSI MEA Conference was held recently under the theme, ‘A Connected World: Smart Cities, Smart Buildings, Smart Infrastructure, and More!’ Tamdeed Projects, a leader in the UAE for outdoor network solutions and a key player and integrator for indoor structured networks, in-building solutions, and ICT infrastructure, was the event’s exclusive diamond-level sponsor. 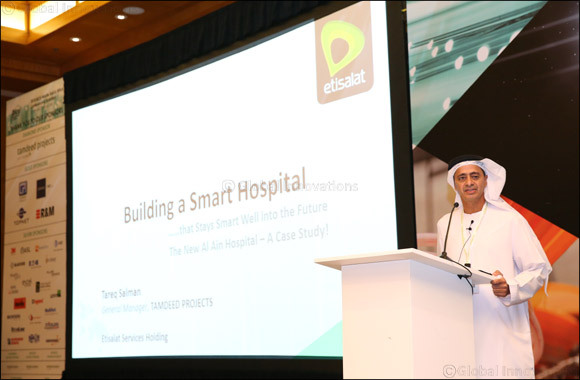 Tareq Salman, general manager, Tamdeed Projects, opened the conference with a Keynote Presentation on ‘Building a Smart Hospital…that Stays Smart Well into the Future’, with the new Al Ain Hospital as a case study. Tamdeed undertook this flagship project and implemented a standards based approach towards survey, engineering, supply, installation, commission, integration, testing the extra-low voltage package of works of this 700+-bed hospital on a turn-key basis. He cited the key learnings of the healthcare project: the importance of integrated building management and security systems; making rooms more patient-centred, and providing a fully-integrated electronic medical record system, way finding and customer feedback kiosks, location tracking devices and electronic status boards that directs patients to respective treatment rooms, display news and health care information. As part of its exclusive sponsorship, Tamdeed sponsored the conference’s Opening Keynote Presentation from Limor Schafman, Director of the Smart Buildings Program at the Telecommunication Industry Association. Her keynote, titled “Powering Digital Transformation in Smart Cities: The Role of Smart Buildings,” covered the macro-challenges facing communities today, the need for a common connected platform and language for smart community development, and a technology review of smart building and smart city platform use cases. The conference was organised by Building Industry Consulting Service International (BICSI), a professional association supporting the advancement of the information and communications technology (ICT) community covering the spectrum of voice, data, electronic safety & security, extra low voltage, audio & video technologies and project management. The event featured workshops and keynote talks from international industry experts presenting on the latest advancements in the world of ICT.